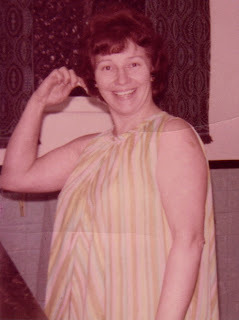 Today, in my puttering around, i discovered a picture of my Mom. Not like it wasn't there all the time, pretty much in plain view, save for opening up the lid of a treasure box. I say discovered because perhaps i wasn't ready to acknowledge that her life wasn't just the deep sadness that resulted in her young death. And that most likely i've been focusing on the events that led up to the ending of her own life rather then the beautiful life she did live. So here she is, hamming it up. This was taken in our main bathroom, in early 1975. What i am remembering about her is that big, open smile, the compassionate loving eyes. She did exude a great joy of life along with love, kindness and care for those around her. At the time of her death, she was the head nurse in the maternity ward at the Prince Rupert General Hospital. I know she was loved and cherished by her colleagues. She loved babies and birthing moms. Through these eyes, i see the woman who gave birth to me. Her death has been both an inspiration and guiding force in my life and at the same time a source of sadness and loss. Even though the physical body is gone, i know she is always with me. I see her in my sister and brother, my children and grand daughter. And she is always here in my heart. Flight, Fight or ? Your Choice.